Benjamin H. Barton. The lawyer-judge bias in the American legal system. Cambridge University Press, 2011. Virtually all American judges are former lawyers. 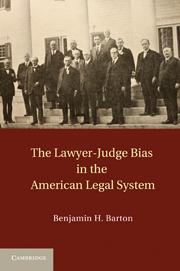 This book argues that these lawyer-judges instinctively favor the legal profession in their decisions and that this bias has far-reaching and deleterious effects on American law. It begins with a theoretical explanation of why judges naturally favor the interests of the legal profession and follows with case law examples from diverse areas, including legal ethics, criminal procedure, constitutional law, torts, evidence, and the business of law. Desislava Nikolaeva Demitrova. Seafarers' rights in the globalized maritime industry. Aspen Publishers, c2010. 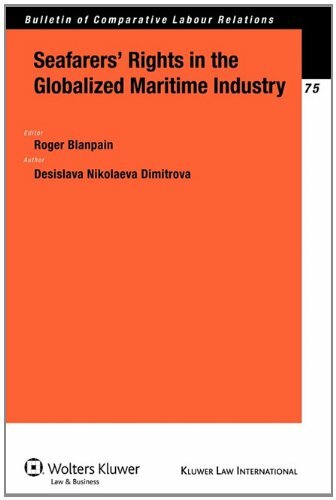 This book examines in detail the structure of the shipping industry, focusing on problems concerning the working and living conditions of seafarers on board merchant ships serving the global sea transport system. Exploring all levels of maritime policymaking on a global and European level, the author analyses seafarers’ rights in the light of international enforcement mechanisms and particularly in the light of the recent ILO Maritime Labour Convention. Competition as public policy. Section of Antitrust Law, American Bar Association, c2010. The federal antitrust guidelines for the licensing of intellectual property : origins and applications. 3rd ed. American Bar Association, Section of Antitrust Law, c2010. John Henry Merryman, David S. Clark, John Owen Haley. Comparative law : historical development of the civil law tradition in Europe, Latin America, and East Asia. LexisNexis, c2010. Towards a European civil code / edited by Arthur Hartkamp, et al. 4th rev. and expanded ed. Aspen Publishers, c2011. Sustainable development in world investment law / edited by Marie-Claire Cordonier Segger, Markus W. Gehring, Andrew Newcombe. Aspen Publishers, c2011. Reference handbook on the comprehensive general liability policy / edited by Alan S. Rutkin, Robert Tugander. American Bar Association, c2010. Intellectual property protection of fact-based works : copyright and its alternatives / edited by Robert F. Brauneis. Edward Elgar, c2009. Politics of intellectual property : contestation over the ownership, use, and control of knowledge and information / edited by Sebastian Haunss, Kenneth C. Shadlen. Edward Elgar Pub., c2009. M. Craig Tyler, et al. Intellectual property dispute resolution : leading lawyers on performing due diligence, pursuing the right ADR approach, and settling infringement claims. Aspatore Books, c2008. Economics of public international law / edited by Eric A. Posner. Edward Elgar Pub., c2010. Sonia J. Buck. Movie therapy for law students (and pre-law, paralegal, and related majors) : are you ready for law school?? : prepare for law school, final exams, and the bar exam by watching movies!!. AuthorHouse, c2009. Iain Goldrein, Matt Hannaford, Paul Turner. Ship sale and purchase. 5th ed. Informa Law, 2008. Brian G. Brunsvold, Dennis P. O'Reilley, D. Brian Kacedon. Drafting patent license agreements. 6th ed. BNA Books, 2008. Amy L. Landers. Understanding patent law. LexisNexis, c2008. Luigi Palombi. Gene cartels : biotech patents in the age of free trade. Edward Elgar, c2009. Patent litigation strategies handbook / edited by Barry L. Grossman, Gary M. Hoffman. 3rd ed. BNA Books, c2010. Ronald D. Slusky. Invention analysis and claiming : a patent lawyer's guide. American Bar Association, General Practice, Solo & Small Firm Section, 2007. Joshua Stein. A guide to troubled commercial real estate loans for lenders and borrowers. LexisNexis, c2010. Jim Bartos. United States securities law : a practical guide. 3rd ed. Aspen Publishers, c2006. Howard Ball. Bush, the detainees, and the Constitution : the battle over presidential power in the War on Terror. University Press of Kansas, c2007. Mary LaFrance. Understanding trademark law. 2nd ed. LexisNexis, c2009. What is a trademark? 3rd ed. American Bar Association, Section of Intellectual Property Law, c2009. Improving health care quality : an integral step toward health reform : hearing before the Committee on Finance, United States Senate, One Hundred Tenth Congress, second session, September 9, 2008. Health benefits in the tax code : the right incentives? : hearing before the Committee on Finance, United States Senate, One Hundred Tenth Congress, second session, July 31, 2008. H.R. 5998, the Protecting Children's Health Coverage Act of 2008 : hearing before the Subcommittee on Health of the Committee on Energy and Commerce, House of Representatives, One Hundred Tenth Congress, second session, May 15, 2008. From the lab bench to the marketplace : improving technology transfer : hearing before the Subcommittee on Research and Science Education, Committee on Science and Technology, House of Representatives, One Hundred Eleventh Congress, second session, June 10, 2010. California desert bill : hearing before the Committee on Energy and Natural Resources, United States Senate, One Hundred Eleventh Congress, second session, to receive testimony on S. 2921, to provide for the conservation, enhanced recreation opportunities, and development of renewable energy in the California Desert Conservation Area, to require the Secretary of the Interior to designate certain offices to serve as renewable energy coordination offices for coordination of federal permits for renewable energy projects and transmission lines to integrate renewable energy development, and for other purposes, May 20, 2010. Confirmation of Representative Hilda L. Solis : hearing of the Committee on Health, Education, Labor, and Pensions, United States Senate, One Hundred Eleventh Congress, first session, on confirmation of Representative Hilda L. Solis, of California, to be secretary, U.S. Department of Labor, January 9, 2009. Building on success : new directions in global health : hearing before the Committee on Foreign Relations, United States Senate, One Hundred Eleventh Congress, second session, March 10, 2010. Afghan women and girls : building the future of Afghanistan : joint hearing before the Subcommittee on Near Eastern and South and Central Asian Affairs and the Subcommittee on International Operations and Organizations, Human Rights, Democracy, and Global Women's Issues of the Committee on Foreign Relations, United States Senate, One Hundred Eleventh Congress, second session, February 23, 2010. H.R. 5175, the DISCLOSE Act, Democracy is Strengthened by Casting Light on Spending in Elections : hearing before the Committee on House Administration, House of Representatives, One Hundred Eleventh Congress, second session, held in Washington, DC, May 6, 2010. H.R. 1232, Veterinary Public Health Workforce Expansion Act of 2007 : hearing before the Subcommittee on Health of the Committee on Energy and Commerce, House of Representatives, One Hundred Tenth Congress, second session, January 23, 2008. Financial services and products : the role of the Federal Trade Commission in protecting consumers : hearing before the Committee on Commerce, Science, and Transportation, United States Senate, One Hundred Eleventh Congress, second session, February 4, 2010. Encouraging innovative and cost-effective crime reduction strategies : hearing before the Committee on the Judiciary, United States Senate, One Hundred Eleventh Congress, second session, March 3, 2010.